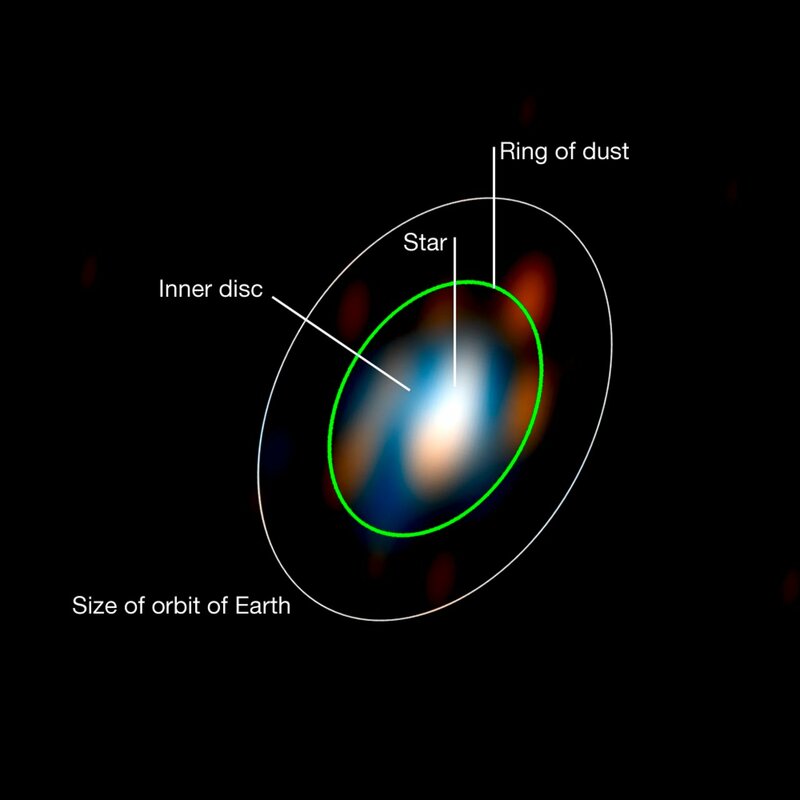 New research carried out using ESO telescopes has, for the first time, allowed astronomers to reconstruct a detailed picture of the inner disc of matter around a young star. Stéphanie Renard of the Laboratoire d’Astrophysique de Grenoble and colleagues used the ESO VLT Interferometer to probe the secrets of the star HD 163296. Young stars are surrounded by discs of dust and gas and scientists believe that it is in these discs that planets are born. Dusty grains in the disc stick to each other to make larger lumps that in turn also aggregate together. This growth is expected to continue until rocky bodies about the size of the Earth are formed. “The power of the VLT Interferometer to probe very fine details now allows us to see the inner region very close to the star where there is not expected to be any dust. 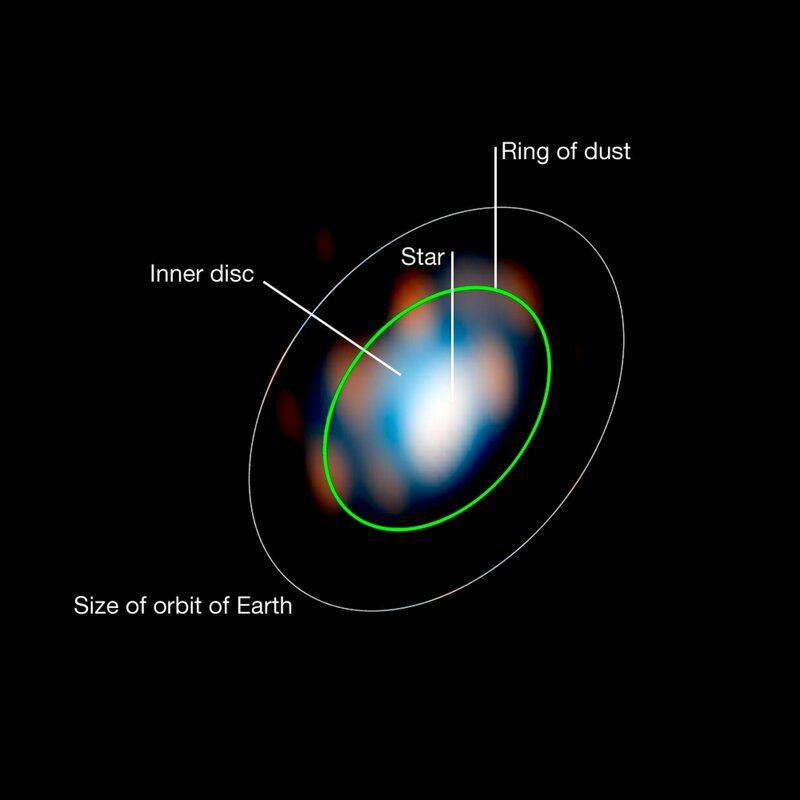 The new images reveal the ring-shaped structure of this very elusive region,” said Renard. No single telescope currently in operation has vision acute enough to study such tiny and distant objects. The size of the region of the disc observed corresponds to 150 million kilometres — about the distance between the Earth and the Sun, but located at 360 light-years from Earth. These very tiny details have an angular size of around 10 milliarcseconds — equivalent to trying to pick out small features on a road map held up 40 kilometres away. These minute angles are far smaller than any single telescope now operating can resolve. 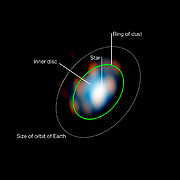 To be able to image the inner part of the disc of matter close to the star, the team used a technique known as interferometry, in which sophisticated instrumentation combines the light from several telescopes into one observation. This increases the level of detail in the resulting pictures dramatically, although it does have some drawbacks: the results have to be reconstructed using complex mathematical algorithms because interferometry does not produce unambiguous images. But this difficult work is worthwhile as the resulting pictures tease out details far beyond the capabilities of the individual telescopes. The team used data from the Very Large Telescope Interferometer, located at ESO’s Paranal Observatory, for the bulk of their work on this star. The facility includes four 8.2-metre Unit Telescopes and four 1.8-metre Auxiliary Telescopes, which can be used in several different combinations to produce interferometric observations. The data was thoroughly analysed earlier this year  but, now, for the first time, the astronomers have been able to reconstruct an image of such a young object, with minimal assumptions, thanks to a powerful mathematical algorithm developed by team member Eric Thiébaut. The resulting image has the detail you would normally expect from a telescope with a mirror over 130 metres across, far bigger than any currently in existence. To gain further precision, the team combined the VLT Interferometer observations with data from CHARA, Keck and IOTA interferometers. This study was reported in "Strong near-infrared emission in the sub-AU disk of the Herbig Ae star HD 163296: evidence of refractory dust?" by M. Benisty et al. 2010, A&A 511, A74. These results will be presented at the JENAM 2010 conference on 9 September 2010, in Lisbon, Portugal, in Symposium 6 "Science Cases for Optical and Infrared Interferometry", and will appear at the same time in the journal Astronomy and Astrophysics (“Milli-arcsecond images of the Herbig Ae star HD 163296”, by S. Renard et al.). The team is composed of Stéphanie Renard and Fabien Malbet (Laboratoire d’Astrophysique de Grenoble), Myriam Benisty (INAF–Osservatorio Astrofisico di Arcetri), Eric Thiébaut (Centre de Recherche Astrophysique de Lyon) and Jean-Philippe Berger (European Southern Observatory).